The moon and Jupiter appear in conjunction over the second largest thermal lake in the world, lake Hévíz in Hungary. 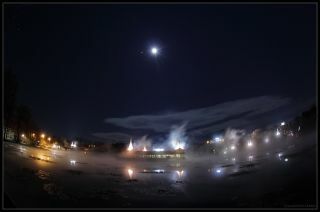 Tamas Ladanyi of The World at Night took this photo on January 2012. The moon and Jupiter appear to rest for a while over the thermal lake of Hévíz in Hungary. Tamas Ladanyi of The World at Night took this photo on January 2012 from the second largest thermal lake in the world (47,500 square meters in area), which is located near the western end of Lake Balaton in Hungary. During the celestial sight, the moon appeared as if to sit slightly above Jupiter in the night sky. When two objects seem to have a close encounter in space as seen from our perspective on Earth, astronomers dub the phenomenon a conjunction. Editor's note: If you have an amazing skywatching photo you'd like to share for a possible story or image gallery, please contact managing editor Tariq Malik at spacephotos@space.com.